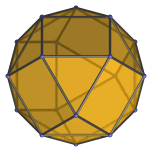 The gyroelongated triangular bicupola is the 44th Johnson solid (J44). 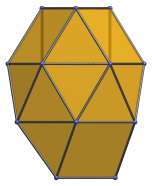 It has 18 vertices, 42 edges, and 26 faces (20 equilateral triangles and 6 squares). The gyroelongated triangular bicupola can be constructed by attaching two triangular bicupolae to a hexagonal antiprism, or equivalently, adding a second triangular cupola to a gyroelongated triangular cupola (J22).